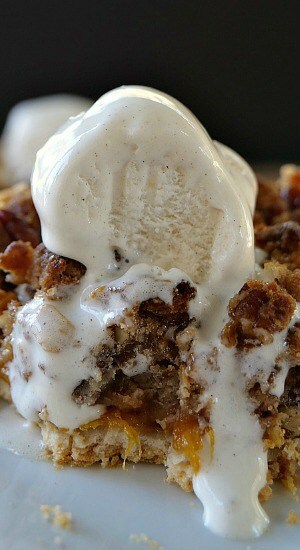 This peach maple pecan crumble is a perfect summer dessert. 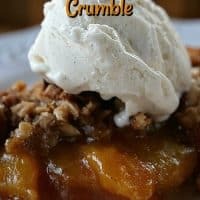 With peach season in full swing and peaches at their finest, this crumble would be ideal to have for dessert tonight, topped with a scoop of vanilla ice cream. Oh yum! 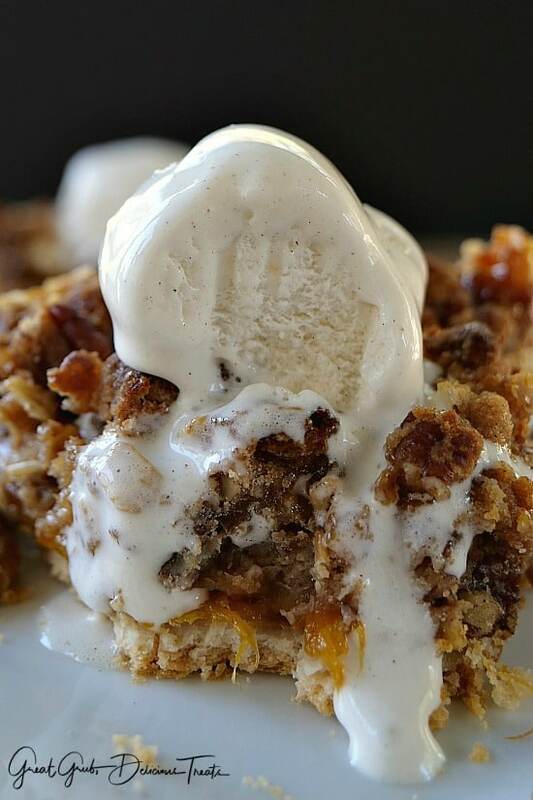 Delicious fresh peaches, with a hint of maple, topped with a tasty pecan oat crumble makes for one tasty treat! 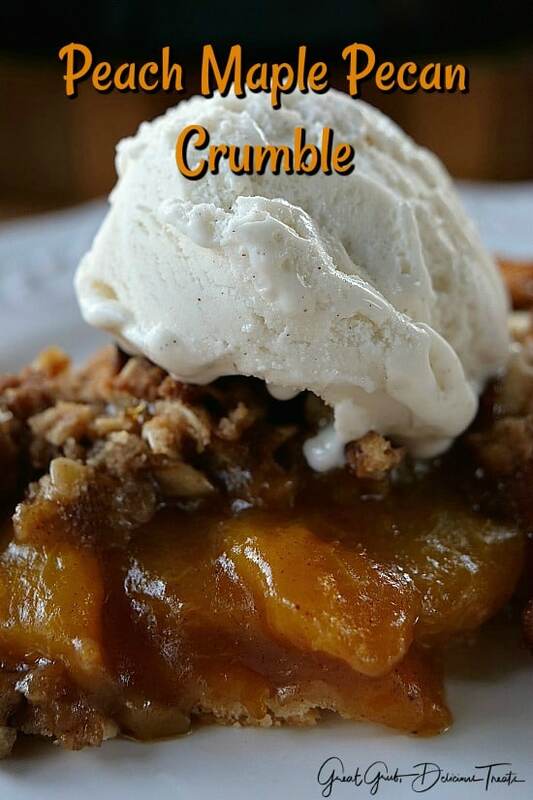 Everyone will love this peach maple pecan crumble. I had some peaches that needed to be used up and my son and his girlfriend were over visiting. 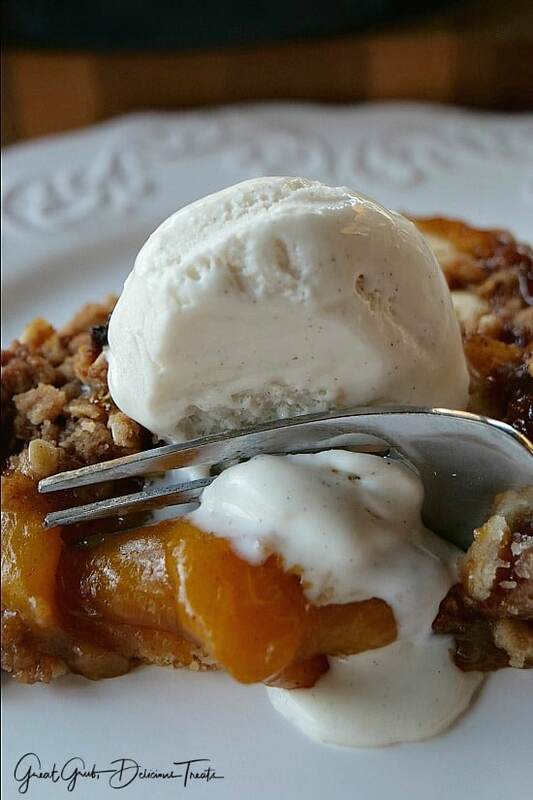 Crystal has been to culinary school and I asked her to make something with the peaches. This is what she made and oh man, was it DELICIOUS! 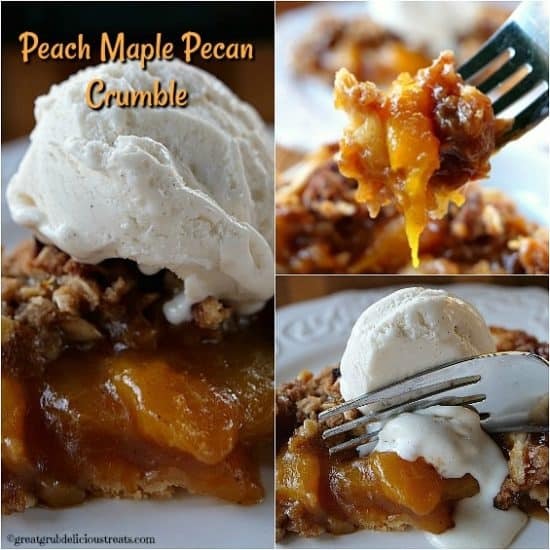 To make this delicious peach maple pecan crumble, start off with a ready made pie crust. Lightly spray a tart baking dish with a non stick spray prior to placing the crust into the tart dish. Next, peel and slice the peaches, place in a large bowl, add brown sugar, maple, lemon juice, cinnamon, nutmeg and corn starch. Gently stir and let sit for 10 minutes. For the crumble, add all the dry ingredients to a medium mixing bowl then add melted butter and stir. Mixture will be crumbly and will be placed on top of the peaches once the peaches are placed into the pie crust. 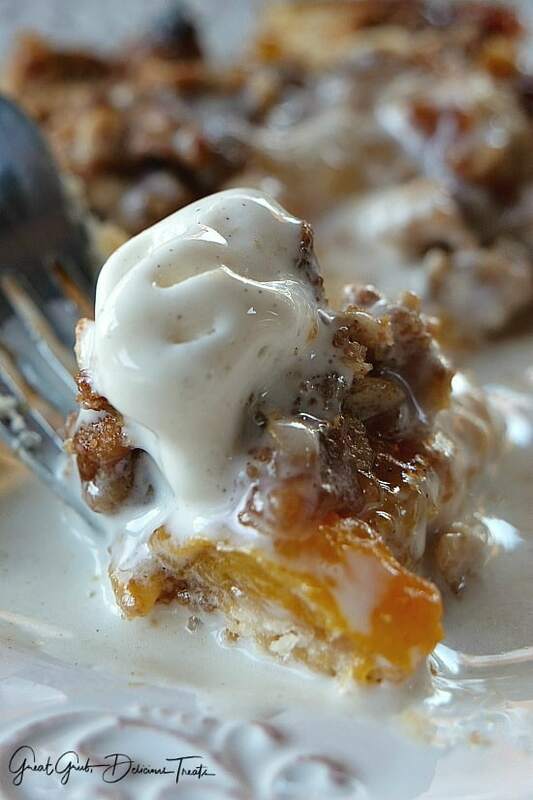 Pop in the oven and in no time, this tasty peach maple pecan crumble will be ready. This recipe was adapted from Sally’s Baking Addiction’s. Make sure to check out all of her delicious recipes. Preheat oven to 400° and lightly spray a tart baking dish with a non stick spray. Set aside. Peel and slice peaches into 1/4" slices and place in a large mixing bowl. Sprinkle brown sugar over the top and add maple extract, lemon juice, cinnamon, nutmeg and corn starch. Mix together and let sit for 10 minutes. In a medium mixing bowl, add all dry ingredients. Stir in melted butter and mix until crumbly. Place uncooked pie crust into baking dish. Pour peaches into dish and top with crumble mixture. 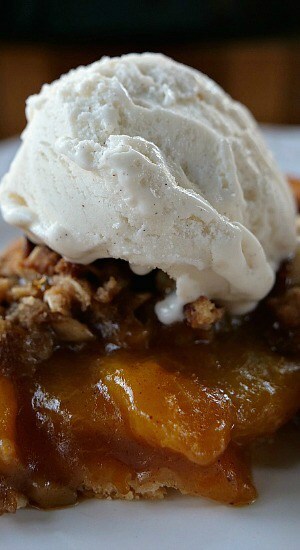 Bake for 40-50 minutes or until the crumble starts to brown and the peaches are bubbling. Place strips of foil around the edge of the crumble if starts to brown too much. 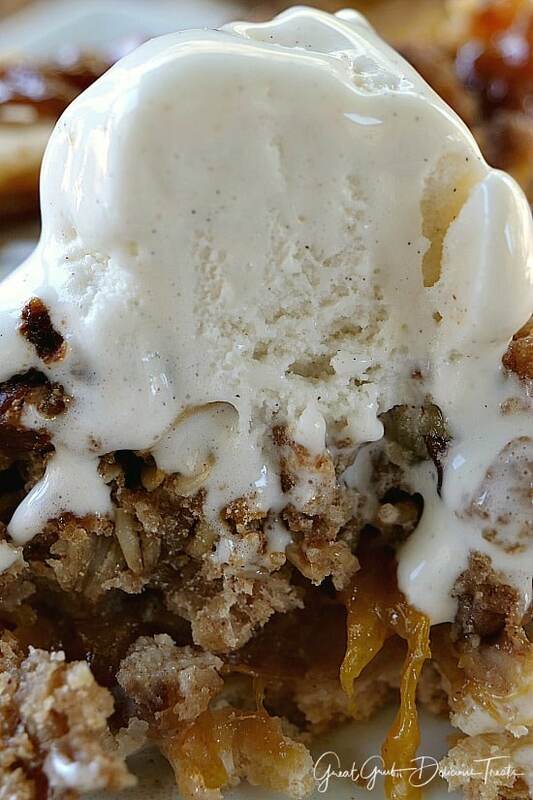 Serve with vanilla ice cream on top. Do you have a receipe book. Or any way I could get a list of them.